Paintings, sculpture, drawings, prints, and photographs from the Middle Ages through the present, including the Samuel H. Kress Collection of Renaissance and Baroque art, as well as pottery, sculpture, and metalwork from ancient Greece and the Roman Empire, dating from the first millennium BCE through the 4th century CE. 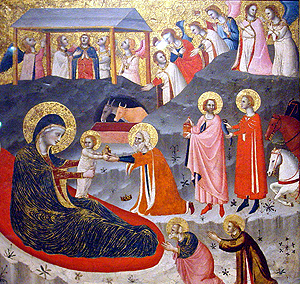 Among the events of Christ's infancy, the Epiphany was particularly important from the standpoint of Catholic dogma because it was the moment when Christ's divinity was revealed for the first time to the gentiles, as represented by the Magi. Normally, the Magi occupy center stage by themselves, but in this unusual illustration of the event they are surrounded by other devout spectators. The crowd includes a bevy of angels (five of whom are singing their hearts out), a donkey, an ox, three toylike horses, and Saints Joseph and Stephen dressed in deacons' robes. Another unique feature of the painting is the warm, human response of the divine infant, who eagerly stretches both arms to accept the gift of a gold vessel from the eldest Magus while turning his head to observe his mother's reaction. Originally, the painting was the left-hand wing of a triptych (a three-panel altarpiece) in the Riminese church of San Francesco. The name given the anonymous master responsible for this charming painting is derived from the subject matter of the altarpiece's other wing, which depicted the vision of the blessed penitent, Clare of Rimini (1262-1328). Like his Riminese contemporaries, the Master of the Blessed Clare maintained certain Byzantine traditions, such as the red couch on which the Virgin reclines, the gold striations of her gown and the robes of Saint Joseph, and the use of a hierarchical scale. At the same time, the emphasis on human interaction, clarity of space, and figural solidity show the influence of Giotto (1266-1337), and the color and modeling reflect the impact of the Sienese artist Pietro Lorenzetti (active 1306?-ca. 1348). "In London, what I love more than anything else is the fog," said Monet. His great series of the River Thames in fog, sunlight, mist, and smoke, painted between 1899 and 1904, is the outstanding example of Impressionist painting of London. Beginning in September 1899, Monet rented a suite of rooms on the fifth floor of the Savoy Hotel, on the north bank of the Thames. From his balcony he could see Waterloo Bridge to his left and Charing Cross Bridge to his right. He worked quickly from the motifs, switching from canvas to canvas to capture the fugitive impressions of light and atmosphere and then took the paintings back to his studio in Giverny, where he completed them from memory and detailed sketches. He returned to London again in 1900 and 1901, eventually producing more than forty paintings of this busy section of the river. The Lowe's picture depicts Waterloo Bridge backlit by morning sun. The massive solidity of the bridge and its arches evanesces out of the refracted haze of sky and water. Objects are equal with atmosphere, drawing with color, observation with memory. 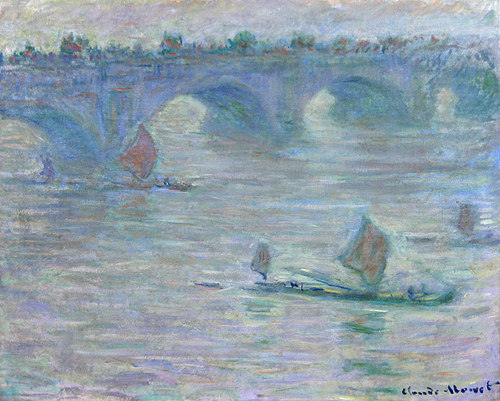 Monet's work, at this mature stage of his career, exists at the intersection of nineteenth-century naturalism and twentieth-century abstraction. 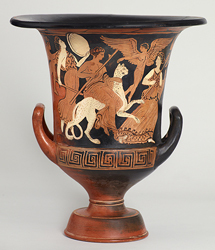 This red-figure calyx krater depicts Dionysus, the Greek god of wine and the harvest, riding a panther and surrounded by an entourage of satyrs and maenads lead by a flying Eros. On the reverse are three draped youths. Kraters, vessels used for mixing wine, came in a variety of forms. The calyx krater, a shape associated with the red figure period of Greek pottery, features a wide mouth and bowl form shaped like the bud sheath of a flower.